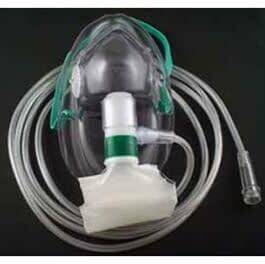 The Curaplex Non-Rebreather oxygen mask features an elongated oxygen mask molded of soft transparent PVC plastic. The tubing adapter swivels to facilitate use on either side of patient, and the spandex-terylene adjustable strap ensures a comfortable fit for every patient. The reservoir bag is constructed of soft vinyl. Available in complete, partial or pediatric styles, and comes complete with 7’ of star-lumen oxygen supply tubing.